Born outside of Detroit, Michigan, lives in Niles, Michigan. Although it might seem the artist N. S. Drew was a trained artist or designer, in fact, her work appears to be her life long passion. She refers to art as her "playground" while nurtured during childhood by her grandmother. She never formally studied art rather she gave in to her imagination. She has since triumphed over personal obstacles and has written and illustrated several books including "Artful Spirit" and "Be Your Own Angel." Her style is colorful, expressionistic coupled with the raw energy of the outsider within. 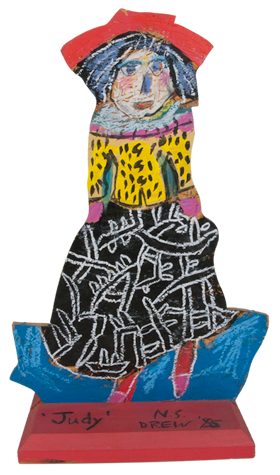 The painted wood cutout titled "Judy" was made in 1985, purchased at a private auction of outsider art in 1996.